Finally I produced the following using white base card and squares of ribbed taupe card mounted on black. The flower stamp was a freebie from craft stamper and I stamped the petals of two images with small rose and butterfly from Stamp Addicts. The middle one I tried to zentangle. I added a strip of card folded over and edged with deco scissors and distressed with Frayed Burlap.A length of ribbon lies just above this although it's not showing up but the 3 black gems are sitting on it! I placed the squares on top and the sentiment was from my zyron digital printer. Very nice Valerie, love the colour combo. 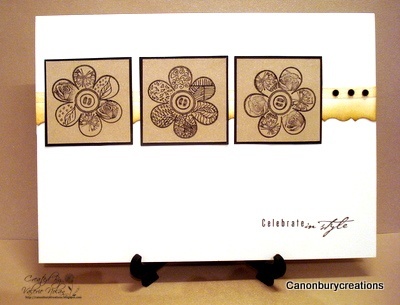 This card would also fit with Simon Says Stamp this week where they have a coffee and cream challenge going on. The second card is really interesting, it's called the spotlight technique I think. I'm not sure the plain white background is setting it off to the best advantage though, but I can't think what to do with it now it's put together! I think your flowery card is fine, but the Venetian one is really interesting. As Brenda has said it's very similar to the Spotlighting technique where certain areas of an image are highlighted in some way. It makes for a super card... really clever and most innovative for our challenge... there are three squares after all, the main image plus the two superimposed squares! For me the whole image is a little high, but the card as a whole is great. Thanks for coming up with something so unique! Great to see you again and see you next time. 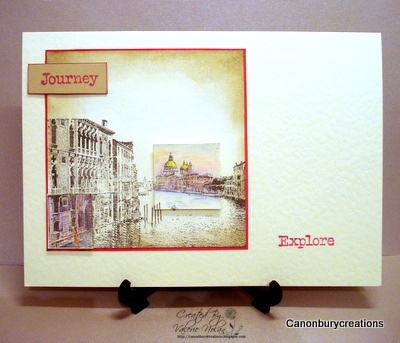 I absolutely love your Venetian card - stunning. Haven't had chance to do my 3 squares yet but I'm getting such fabulous ideas whilst blog hopping. I love the flowers squares - really CAS - lovely! However, I think the Venetian scene is really super. I love the spotlight technique; it really adds dimension. I think the image needs to be just a bit lower, giving an even border around. But I love! LOVE the Venetian card. The spotlight technique looks amazing with this stamp. I think I would have tried it mounted on black card, for a bolder look. Both are beautiful! Love the colours in them. The Venetian one is really special, great technique! 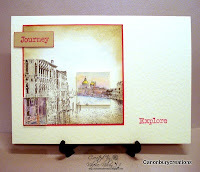 I love your venetian card - what an interesting take on the challenge! Even though I used the spotlighting technique last week it would never have occured to me to use it in two places on one image. I think the overall card is stunning, and very well balanced. Love how you did the flowers, its a beautiful card. Think we were on the same trand of thought as I used that stamp as well. Your Venetian one is stunning, love the way you highlighted the squares. Both great cards. I particularly like the Venetian one as it looks amazing. Absolutely love the Venetian one Val - stunning. Also like your entry for LIM although doesn't have as much impact as the other one. Definitely a spotlight method. Both cards are very nice...but I really love the Venetian card! Very cool technique to spotlight the two areas on the stamp. Not sure how you did that, but I'd love to! I might have moved the imaged down a bit, but I'm all about lining things up! LOL! both cards are lovely, but i really like the 2nd one alot! Beautiful cards, your Venetion one is truly inspiring for me. your cards are lovely. you did fine with the challenge. I love your Venetion card, what a fab idea to do the spotlighting technique, also love how you have added pattern to the flowers on the first card, great ideas. Two brilliant cards, I love the Venetian one. Well I love this card, the tones and the stamp just look so good. I like both cards, its a pity the ribbon didn't show well in the photo. I like the venetian card as well and agree with those who say the image should be a bit lower. I know it doesn't fit with the less is more idea but I think that image would look fabulous on a more distressed background with some other ephemera. Hi Valerie, I see what you mean about placing your squares on the opposite edge, but the elements still all work very well together. The Venetian one is a great idea, I love the highlighted areas. Two great cards, I think my favourite is the Venetian card it takes me back to a wonderful visit we had there, beautiful colours. The three flowers card is lovely but the Venetian card is an absolute stunner! I wish there had been a bigger picture!